So, I tweeted this issue and immediately received support and/or agreement from @vanityforce__c, @timothyainman, @RatherGeeky, @sfdc_nerd, and @aognenoff. We had a surprisingly effective and engaging interaction about different approaches considering we were each limited to 140 characters… minus the ‘mentions’. So I am posting what I ended up implementing after digesting their guidance. Thanks guys! The basic idea is that while you can’t use cross-object formulas on the Owner of a record… you CAN use a custom lookup relationship to the User object. So we’re going to create our own lookup field and then make sure it is always synchronized with the standard Owner Field. First step, make your lookup field. It doesn’t matter what object you’re working with, standard or custom, but in this example I will work with the Lead object. I chose to call my field “Owner (Copy)” with a technical name of “Owner_Copy__c”. You probably don’t want to add it to any page layouts because it will just confuse people. Next we add the trigger which is going to keep our “Copy” field always in sync’ with the actual Owner. The code is below, note that a check is done on the first three characters of the Owner Id… the reason for this is that Leads (and perhaps the object you are working with) can be owned by Queues. In the event that the record is owned by a Queue we don’t want to try to populate our new lookup field with the ID because we’ll just get an Apex error… and no one wants that. 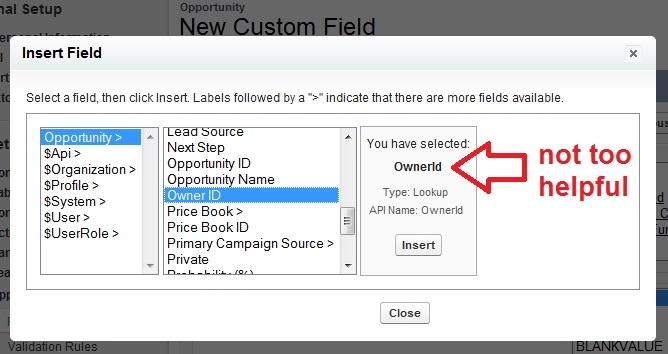 So now all you have to do is create a Formula Field, or a Validation Rule, or define criteria for workflow via formula, (and maybe some other places…hmm) and when you click the “Insert Field” button you will be able to select “Owner (Copy) >” (or whatever you called your field) and insert fields from the Owner into your formula! Because its a lookup you don’t have to worry about changes to the Owner’s User record… your formulas will reflect the current values always. Don’t forget to write a healthy test class to make sure this Trigger plays well with your other Triggers. Also, you will need to initialize your Copy field, because while it will handle changes going forward, your existing data will not be automatically populated by creating this Trigger… so export your Owner Id for all records, and pop it into the “Copy” field after you’ve got your Trigger in place. Cheers!